"It kind of feels like it's a done deal." Without the ferry, people expressed concerns about increased traffic, environmental impacts, cost and change to the community character. It started last June when Williams and Mike Bezner, assistant director of transportation and development, accepted comments at a meeting and came up with four alternatives: to continue operating the ferry; to stop ferry operations; to build a publically funded bridge, which automatically was out because the county doesn't have the money; or build a toll-funded bridge at the ferry site. It was immediately apparent, even though both Williams and Bezner stressed that no decision has or would be made before March, that the toll bridge is the preferred method. "It kinda feels like it's a done deal," one speaker said of the bridge. The draft report was distributed and showed numbers that many in the audience claimed were flawed. They loved riding the ferry. Audience members had some valid points, according to Bezner, but some of the statements and questions could be construed as less than tactful; yet, he said he tried to answer tactfully. Some of the more positive comments noted the "historical value of the ferry and the potential for lost revenue for tourism, because the ferry does attract tourists to Canby," as one audience member said. Another wondered if they couldn't continue the ferry even as they built the bridge. 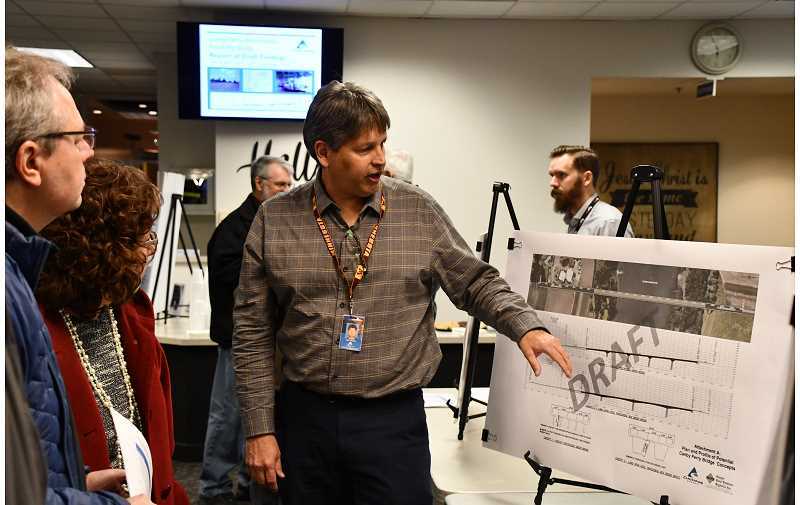 Mindy Montecucco, chair of Canby's Bike and Pedestrian Advisory Committee, voiced her concerns about the two-lane bridge and potential lack of shoulder improvements on the roads to and from the bridge. She noted that the bridge could bring a number of major accidents and "then there's the heavy fog we suffer during the winter months. It's necessary to take bike commuters into consideration with the added traffic," she said. Another speaker noted that there would be all kinds of traffic on the bridge. "Besides residential traffic, there likely will be semis and what's going to happen when one tries to pass another on this two-lane bridge? There will also be farming and rural traffic going 10 miles per hour, slowing traffic and creating bottlenecks," he said. "I'm a city planner," said another. "This is insulting. It's a bridge to nowhere. Spending our kids' money and chewing up all the farmland," he said. "Roads bring in business and industry, we need to have good roads. We don't need a $107 million bridge that goes nowhere," he added in response to the county's decision not to do too much to the roads to and from the bridge. After the meeting, City Councilor Traci Hensley told the Herald that she sees the conundrum as two different issues. "One is the bridge and the other is the ferry. The bridge is a bad idea. It will increase traffic among our residential areas," she said. The conversation continues at the next listening session Feb. 19 at the same location.